U.S. adults under 30 have significantly more positive views of China than older Americans, with roughly half (49%) giving China a positive rating, compared with 34% of those ages 50 and older. More than half of older Americans (53%) have an unfavorable view of China, with 20% saying they have a very unfavorable opinion. Americans under 30 are also more likely than those ages 50 and older to identify China’s economic strength as more of a threat than its military capabilities (65% vs. 52%). But the U.S. public’s anxieties about China are not exclusively economic in nature. 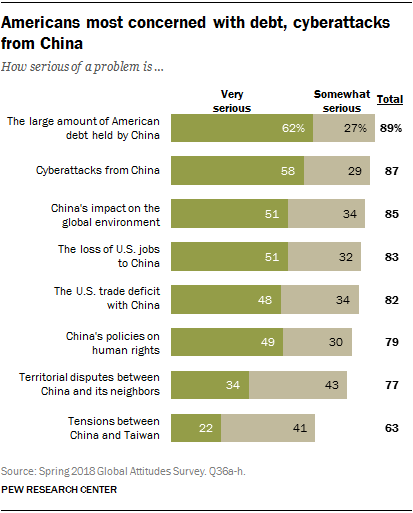 When asked about eight specific issues affecting the U.S.-China relationship, majorities of Americans rank all eight as at least a somewhat serious problem, with roughly six-in-ten citing the large amount of U.S. debt held by China (62%) and cyberattacks as very serious problems (58%). About half also voice very serious concerns over the loss of jobs to China, the U.S. trade deficit with China, China’s impact on the environment and Chinese human rights policies. (This survey took place amid initial reports that up to 1 million Uighurs, a Muslim ethnic minority in Western China, have been sent to government-run re-education camps.) Territorial disputes between China and its neighbors and tensions between China and Taiwan generate fewer concerns among Americans than the other issues (34% and 22% of Americans, respectively, say these are very serious concerns). Republicans are somewhat more likely than Democrats to say economic tensions between the U.S. and China are very serious problems. The partisan gap is especially notable on U.S. jobs moving overseas to China, Chinese-held American debt and the bilateral trade deficit. Only when asked about China’s environmental impact do significantly more Democrats than Republicans voice concern. In general, those ages 50 and older tend to show more concern about potential problems between the U.S. and China, especially on the issue of cyberattacks, losing U.S. jobs to China and territorial disputes between China and its neighbors. Younger Americans (58%) are much more likely than older Americans (48%) to worry about China’s impact on the environment. More broadly, Americans are keen on keeping U.S. hegemony in the face of the perceived threats from a rising China. Nearly three-quarters in the U.S. (72%) acknowledge that China plays a more important role in the world today compared with 10 years ago, and a third of Americans believe China, not the U.S., is the world’s leading economic power. However, 88% of Americans say that having the U.S. as the world’s leading power would be better for the world. 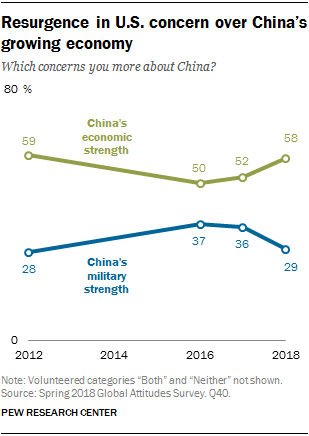 Beyond the desire to retain its status as the main global power, these sentiments could also in part reflect Americans’ apprehension toward Beijing. Half of Americans have no confidence in Xi Jinping to do the right thing regarding world affairs, compared with 39% who have confidence in him. And a large majority in the U.S. say China does not respect its citizens’ civil liberties, with about eight-in-ten (79%) holding this opinion. At the same time, a majority of Americans (59%) said in a September Pew Research Center survey that the U.S. should cooperate more with China, the same proportion sharing this sentiment in 2017. The survey also found that about a quarter of Americans (26%) name China as their most or second-most important partner for conducting foreign policy, the second-highest ranking country behind the United Kingdom. More traditional allies like Israel (12%) and Germany (9%) ranked lower.